Every year at the end of February, I take part in a charity bowling event in Napa. It’s called the Gutter Ball Classic benefiting a wine industry scholarship fund. The first tournament was founded by Riccardo Gaudino and Margrit Biever Mondavi to commemorate the “immigrant” American Dream on the 100th Anniversary of Antonio Rossi in Napa Valley from Genova Italy. It’s great fun and where else can you bowl and get credited for a strike when you knock down 9 pins, win wine in a raffle, and see friends that you don’t get to see but once a year??? 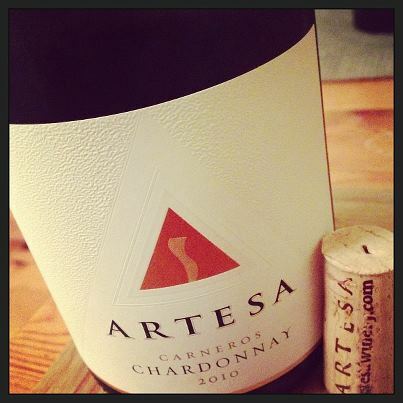 I wasn’t able to attend this year but a friend of mine won the Artesa 2010 Carneros Chardonnay. She was very kind to share with me. I took the bottle and immediately read the back label. I saw the words “hint of oak” and thought I have to see what they mean by “hint.” Of course, those of you who know me well, know that I am an unoaked Chardonnay winemaker and drinker. But the word “hint” caught my attention enough to give this a try. The wine in my glass was a very beautiful gold color. On the nose I found apple, pear, stone fruit, hint of spice with vanilla and oak. On the palate a strong buttery, toasty oak with tropical fruit and a nice crème brûlée texture. I love using the term crème brûlée simply because I rarely get to taste it since I am drinking unoaked white wines most of the time. The acid helps balance this wine tremendously. I dare say the “hint” of oak was nowhere near what I call a “hint.” If you like a nicely balanced, creamy chardonnay with more than a “hint” of oak then this is the wine for you. The winemaker for Artesa Winery is Mark Beringer. Following his passion for winemaking, he attended Santa Rosa JC, and later, California State University, Fresno where he graduated in 1990 with a B.S. in Enology. His winemaking philosophy begins in the vineyard. He values meticulous farming practices. Mark handcrafts wines from single vineyard blocks, treating them individually and keeping them separate throughout the winemaking process. Style by appellation is central to his winemaking philosophy. Only the best lots become Artesa wines. Artesa focuses on producing small, ultra-premium lots of the varietals for which the Carneros and the Napa Valley are best known – Chardonnay, Pinot Noir, Merlot and Cabernet Sauvignon. This winery is situated in the beautiful Carneros AVA…a wonderful place to visit.